For the third straight year, WPRNY has helped AtlasCorps to broadcast American Express Leadership Academy’s Global Alumni Summit from downtown NYC. 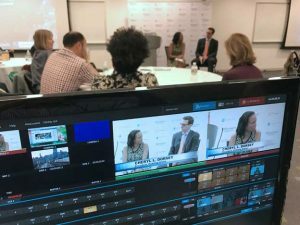 This year’s Global Alumni Summit featured a conversation between Cheryl L. Dorsey, pioneering social entrepreneur and President of Echoing Green, and The Chronicle of Philanthropy’s Cody Switzer. We also were able to broadcast directly to The Chronicle of Philanthropy’s facebook page. The American Express Leadership Academy is a social responsibility arm of American Express and as one of the things they do, they are committed to training leaders of non-profit groups in order to make them more effective. This is a mission that we at WPRNY are happy to support via providing live web broadcasts of their keynote talks, not just for Atlas Corps but also for The Center of Creative Leadership. If you’re looking for help broadcasting your meetings from NYC, please reach out to WPRNY and we would love to help.